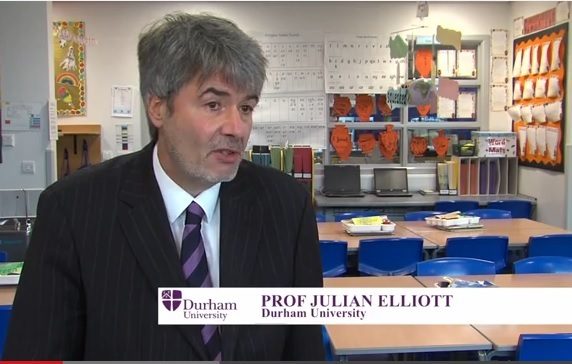 Professor Joe Elliott of Durham University in the UK is one of the authors of a soon-to-be-published book arguing that the diagnosis "dyslexia" is poorly-defined and not useful. Pre-publicity for this book says that he and co-author Elena Grigorenko examine how reading difficulties are conceptualised and tackled, and discuss the latest research in cognitive science, genetics and neuroscience. They argue that the interpretation of the term "dyslexia" often does a disservice to children, and that resources and effort currently put into diagnosing dyslexia would be much better put into improving early teaching, and making sure that all strugglers get the extra help they need. This makes a lot of sense if you're thinking at a population level about how to improve all children's literacy skills in future. But what about current learners who have already tried to learn to read, and failed? Who gets a dyslexia diagnosis? Sometimes it seems like the main thing children diagnosed with dyslexia have that other strugglers don't have is articulate, determined, capable, middle-class parents. These parents keep searching for the reason their children are failing to thrive, and a program that will help them, long enough for someone to say the D-word. This has the immediate positive effect of making the problem seem medical and serious. Once you have a diagnosis, there's no more "wait and see". Action is required. Once you type the D-word into a search engine, you find plenty of good programs that will help (as well as a few snake oil vendors, but most capable middle-class parents can soon spot them). However, a dyslexia diagnosis has the negative effect of firmly locating the problem within the child, and thus absolving the educational system of its contribution. The main educational contribution is our universities' and Education departments' failure to train and equip teachers to teach 95-97% of children to read in their first year of school, not just 80-85% of them. Teachers repeatedly tell me they learnt very little about our language's sounds and complex spelling system at university, and nothing at all about Synthetic Phonics. This is consistent with the findings of the 2005 National Inquiry into the Teaching of Reading. Children who still can't read after a year of trying are usually either very down-in-the-mouth or highly stressed little people. Having such unhappy and unsettled little people in one's classroom day after day, and trying but being unable to help them, is very bad for teachers' job satisfaction. Teachers' smiles are a mile wide when these kids get the right sort of help, and start to catch up. The ones I know bail me up in the hallway or staffroom with the news that Chloe just read a Level 26 book, Mohammed got 10/10 for his spelling test or Jayden was so stuck in his book that he was still sitting in the classroom reading five minutes after everyone else had gone out to play (names have been changed to protect the ratbags). They want to know how to provide this sort of help in the classroom too, and it's time they were trained and equipped to provide it. Who doesn't get a dyslexia diagnosis? Meanwhile, the children of less well-resourced, articulate parents tend not to be dragged off to Psychologists, Speech Pathologists, Special Educators and others for assessment and intervention, or given tutoring outside school. Their families often can't afford it, might have language and/or literacy difficulties themselves, or may not speak much English, for starters. Inside the school system, if they're unlucky, these children can be sentenced to years endlessly and pointlessly studying the 100 most frequent words list, till their self-esteem and willingness to keep trying deteriorates, and often so does their behaviour. Many end up in the Principal's office, labelled with behaviour problems, and set on a path that leads to the juvenile justice system. For these kids, having the middle-class kids diagnosed with "dyslexia" is actually a negative, because it helps schools maintain the view that most reading problems are due to child factors, not teaching factors. This in turn prevents the critical analysis of how the teaching system – teaching literacy in big, indigestible lumps rather than in a fine-grained, digestible form – has helped cause these kids' misery. One day, early years teachers will teach in a way that prevents most reading failure, and the 3-5% who have persistent problems won't need a dyslexia diagnosis. Schools will routinely target their difficulties as soon as they appear, first in small groups, and then if problems persist, individually. In the meantime middle-class parents will probably keep seeking dyslexia diagnoses, and some professionals will keep providing them, as a way of having reading and spelling problems taken more seriously, and locating effective programs. Who can blame them? Not being able to read or spell is a serious, serious problem, whether it's called dyslexia or not. The book won't be available till next month, but if you want to pre-order one now, click here, then type "the dyslexia debate" into the search field. I look forward to getting my hands on a copy. This entry was posted in assessment, literacy problems, research, teaching strategies on March 16, 2014 by alison. Hi Alison – yet another great easy-to-read posting – flagged up by Susan Godsland via the UK Reading Reform Foundation website at http://www.rrf.org.uk . I've provided a link to my Phonics International message forum thread on Joe Elliot's new book. I'm one of the so called dyslexics. I have found you comment above spot on, that it is not the child that is at fault but the education system. A child with a different thought process is seen as difficult and of low IQ standing. I have 2 children and I know that the youngest one has a different way of thinking, but to try and get help in identifying why he is the way he is is an up hill struggle . It is so true with what you have said, middle class families are able to get their children extra help because they're in a strong financial position, where families less capable of getting the help early on are the ones left to struggle, and having children that either rebel against the system or increase their chances of never achieve success in their lives and always seeing themselves as failures in society. PS. 10 plus years of a failling education system has taken me a lifetime to correct – I'm nearly 50. Please feel free to correct this comment. Keep up the fight! Thank you for your support. Yes, you are very correct in what you have described that a child/adult whole struggles to process information needs more time to learn (the code of English language and a deeper understanding of mathematics). As you have suggested that the problem is not the child but how the education system implements the teaching of children. Here in the UK, the system is to ram so much information into a child by rote learning to pass a certain level of testing in their education that it can have negative effect on same children. (This method does not help, as slower children are the ones who suffer and get left behind). This is what I found at the moment with my son's school, that the homework they send him is too much- 3 hours a night same nights where it’s supposed to take 20 minutes. Remember he is only 7. Because he has started to fall behind they have started to send more homework to help him with his comprehension. I asked the school to halve his homework but they made out that extra work is to help him and it is my choice to help him. Thus, putting me and my son under more pressure. All I want is less homework, so I can give him more time on individual work and a deeper understanding. guidance on how to move forward in getting the assessment in place. Please feel free to correct any spelling/grammar. This is what can be achieved with a slower,deeper understanding of the English language by using phonics, reading and writing on a daily basis. I left school at 17 couldn't read or write -could only spell my name and address, and that was a challenge. Congratulations on learning to read and spell as an adult, that must have taken a lot of effort and persistence. Sorry to hear your 7-year-old is getting buried under a pile of homework, I agree that quality is the key rather than quantity, though some practice is necessary to make skills fast and automatic. I hope you find the things you need, there are lots of free and affordable things around that work well, I hope most of them are listed on this website, but if you find things that are missing and would like me to add them, just say so. Thanks! i have 6 year old daughter, diagnosed with CP. She is very intelligent but unable to walk. I am looking for a school that can help her with her education. Can you help please? Alison: You can send her to your local mainstream school, they have to teach her, under the disability discrimination law. Mainstream schools can and do educate students with cerebral palsy, they just need to make sure they have the right equipment e.g. ramps, accessible toilets etc. Don’t take no for an answer, choose the school she and you want her to attend, and they must be able to make it work. Disability organisations and therapists in the school system will be able to help.